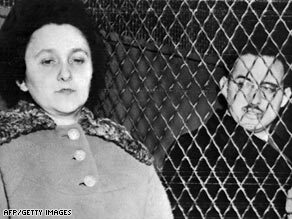 NEW YORK (CNN) -- After 58 years, historians and journalists will have a chance to examine the secret grand jury testimony of witnesses in the espionage case against Julius and Ethel Rosenberg. Ethel and Julius Rosenberg in 1953 in a New York police van shortly before their execution for spying. The couple was investigated in 1950, tried in 1951 for conspiracy to commit espionage and convicted and sentenced to death in 1953. Cold War scholars are hoping the grand jury transcripts will shed light on some nagging questions about the case -- primarily, just how strong the case was against Ethel Rosenberg. The National Security Archive, the American Historical Association, the Georgetown University Law Center and others have petitioned to have the transcripts of 46 witnesses released to the public. In an unusual move, federal authorities have said that because of the historic significance of the case, they do not oppose releasing the transcripts of testimony from witnesses who have died or who do not object to their release. Of the 46 grand jury witnesses, 36 are either deceased or do not object to releasing the transcripts. Three others are thought to have died; four have not been located. In a partial ruling Tuesday, U.S. District Judge Alvin Hellerstein denied a request to release the testimony of three other witnesses, including one of the most controversial -- David Greenglass, Ethel Rosenberg's brother and a pivotal witness who testified against the couple. Greenglass' attorney sent Hellerstein two letters asking that his testimony not be released. He offered to provide information to support that request, but stipulated that that information be sealed. "The circumstances that led to the testimony of Mr. Greenglass before the grand jury in 1950 were complex and emotionally wrought," his attorney wrote in one letter to the judge. "Mr. Greenglass and his family were thrust into an ... unwanted spotlight which has dogged their lives ever since," the other letter said. In the 1940s, Greenglass was an Army sergeant working at the Manhattan Project, the atomic bomb project, in Los Alamos, New Mexico. He eventually confessed to being a spy recruited by Julius Rosenberg and agreed to testify against the couple at trial. Greenglass' wife, Ruth, had also been under investigation and was threatened with indictment. Ruth Greenglass, who died earlier this year at age 84, told investigators she had seen Ethel Rosenberg type up her brother's notes. At the trial, Greenglass confirmed his wife's account. Before that testimony, however, the case against Ethel Rosenberg was considered much weaker than that against her husband. According to New York Times reporter Sam Roberts, who interviewed Greenglass for his book, "The Brother: The Untold Story of the Rosenberg Case," Greenglass said he lied on the stand in the case and in fact did not clearly remember whether it was Ethel or his wife who had typed his notes. David Vladeck, representing the petitioners, argued for the release of Greenglass' grand jury testimony, saying the witness had compromised himself by discussing the case in the Roberts book and on the CBS news program "60 Minutes." Vladeck said Greenglass has told others he was pushed by the government to change his story before testifying. "He points an accusing finger at the U.S. attorney's office and said the government pressured him to lie," Vladeck said. Hellerstein rejected that argument. "He may be a scoundrel, he may be a liar," the judge said, but the facts "don't override my judgment on the value of grand jury secrecy." Although he sided with the government on the Greenglass matter, Hellerstein urged officials to locate the remaining witnesses to obtain consent for releasing the documents. "Time is precious to those who research," he said. "The public interest is best satisfied by the prompt and proper release of information." Assistant U.S. Attorney Andrew McNeela said the government was not arguing that the transcripts never be disclosed, but that they "should not be disclosed at this time." Hellerstein instructed McNeela to report back to court on August 26 after making a last push to find the remaining witnesses. One former defendant in a related case, Miriam Moskowitz, is opposed to having her grand jury testimony disclosed, and Hellerstein therefore denied the petitioners' request to release it. Moskowitz was convicted in 1950 of conspiracy to obstruct justice by allegedly helping her business partner, Abe Brothman, deceive the grand jury. Now 92, she expressed relief that the transcripts would not make it into the hands of the Cold War historians, "because I know they will not write the truth."